When it comes to hair stylers, it is important to choose a good brand. Reputable electronics manufacturers usually produce high quality appliances. Panasonic is one of the most sought after brands for beauty care products, and with good reason. Therefore, you can never go wrong with their hair stylers. But, what sets Panasonic apart from the rest? To find an answer to this question, let’s have a look at the advantages of hair stylers from this brand. Depending on your chosen model, Panasonic hair stylers can have one or more of the following key advantages. • Versatile hair stylers – If you want a beauty appliance that will meet all your hair styling needs, then Panasonic is the brand to choose. Panasonic offers 6 or more attachments with their hair stylers. For instance, some models come with a nozzle for drying hair; air iron for hair straightening and curling; volume lifter that adds bounce and volume to hair; roller brush for creating soft and big curls; and a slim roller brush for making small curls. 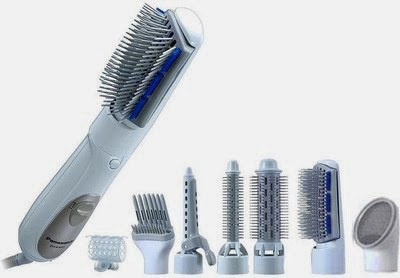 All these attachments make Panasonic hair stylers so versatile that they can replace a number of beauty appliances. • Easy to use – There are several features that make Panasonic hair stylers easy to use. To begin with, the slim and compact body offers an easy grip. The barrel itself is lightweight, thus making the wrist intensive task of styling your hair less strenuous. What’s more, most of these hair stylers have a long, 360o swivel cord that is tangle free and allows you to move around without restrictions. • Silent Hair Styler – Some hair stylers from other brands can be obnoxiously loud when operating. However, some models from Panasonic come with a silent operating mode. This allows you to style your hair without worrying about disturbing other people around you. • Cost effective – The fact that Panasonic hair stylers come with multiple attachments that have many uses makes these beauty appliances cost effective. For instance, thanks to the air iron component, you won’t have to purchase an additional appliance for permanent hair straightening. As a result, these all-in-one hair stylers will save you money in the long run. Do all Panasonic Hair Stylers Have the Same Advantages? It is important to note that Panasonic hair stylers are not created equal. The reason for this is that some models have better functions. For instance, the Panasonic EH-KA81 hair styler is one of the select few models with a silent operating mode. Other makes such as the EH-KA-42 and EH-KA22 lack this feature but have all the other advantages explained above. Hence, it is important to know what features come with the particular Panasonic hair styler you would wish to purchase.